The Coast Guard is searching for the owner or operator of an unmanned adrift black kayak found one mile offshore of Kahaluu Beach Park, on the Big Island, Tuesday. An MH-65 Dolphin helicopter aircrew from Coast Guard Air Station Barbers Point is currently searching for a possible person in the water. Anyone with information that may help identify the owner or operator of the kayak is asked to contact the Coast Guard Sector Honolulu Command Center at 808-842-2600. Watchstanders at the Sector Honolulu Command Center received a report at 10:40 a.m., from a good Samaritan stating they had recovered a black kayak in the vicinity of Keauhou Bay near Kahaluu Beach Park. Sector Honolulu issued an urgent marine information broadcast notice to mariners and launched the Dolphin crew. There are currently no reported signs of distress or missing persons in the area. The Coast Guard offers free “If Found” decals to be placed in a visible location on small, human-powered watercraft through the Operation Paddle Smart program. The information on the sticker can allow response entities to quickly identify the vessel’s owner and aid search and rescue planners in determining the best course of action. Positive identification may also allow the item to be returned to the owner. 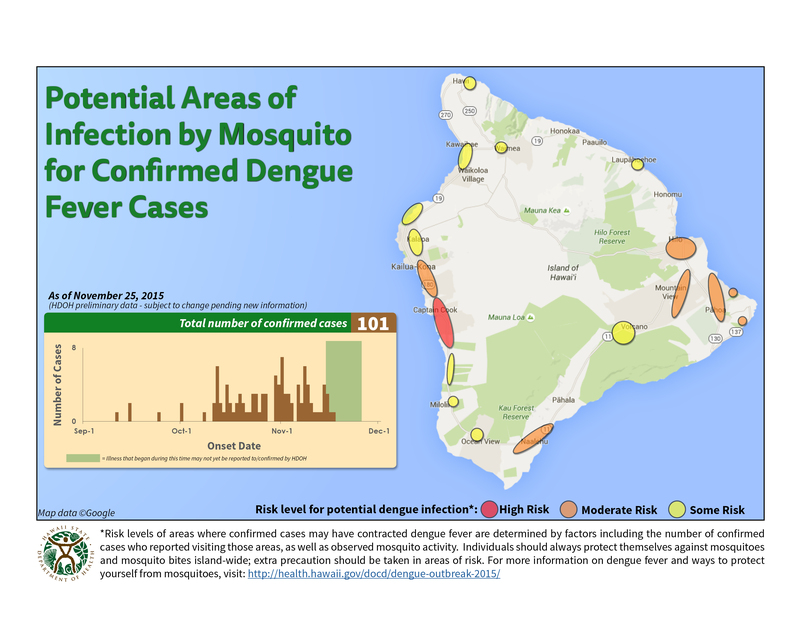 The Dengue Fever outbreak on the Big Island continues and the total confirmed amount of cases rose by 5 more case since the last update bringing the total amount of confirmed cases to 207. Since the last update, HDOH has identified 5 new cases of dengue fever. Currently, as many as 6 of the confirmed cases to date are potentially infectious to mosquitoes. All others are no longer infectious. Of the confirmed cases, 187 are Hawaii Island residents and 20 are visitors. 168 cases have been adults; 39 have been children (<18 years of age). Onset of illness has ranged between 9/11/15 – 12/31/15. As of today, a total of 805 reported potential cases have been excluded based on test results and/or not meeting case criteria. The Dengue Fever outbreak on the Big Island continues and the total confirmed amount of cases rose by 5 more case since the last update bringing the total amount of confirmed cases to 195. Since the last update, HDOH has identified 5 new cases of dengue fever. Currently, as many as 8 of the confirmed cases to date are potentially infectious to mosquitoes. All others are no longer infectious. Of the confirmed cases, 176 are Hawaii Island residents and 19 are visitors. 158 cases have been adults; 37 have been children (<18 years of age). Onset of illness has ranged between 9/11/15 – 12/27/15. As of today, a total of 750 reported potential cases have been excluded based on test results and/or not meeting case criteria. The Dengue Fever outbreak on the Big Island continues and the total confirmed amount of cases has risen by 3 more cases since the last update bringing the total amount of confirmed cases to 160. Since the last update, HDOH has identified 4 new cases of dengue fever. Currently, as many as 7 of the confirmed cases to date are potentially infectious to mosquitoes. All others are no longer infectious. Of the confirmed cases, 143 are Hawaii Island residents and 17 are visitors. 126 cases have been adults; 34 have been children (<18 years of age). Onset of illness has ranged between 9/11/15 – 12/9/15. As of today, a total of 627 reported potential cases have been excluded based on test results and/or not meeting case criteria. Of the confirmed cases, 93 are Hawaii residents and 14 are visitors. 83 cases have been adults; twenty-four have been children (<18 years of age). Onset of illness has ranged between 9/11/15 – 11/18/15. As of today, a total of 230 reported potential cases have been excluded based on test results and/or not meeting case criteria. Of the confirmed cases, 88 are Hawaii residents and 13 are visitors. 78 cases have been adults; twenty-three have been children (<18 years of age). Onset of illness has ranged between 9/11/15 – 11/17/15. As of today, a total of 190 reported potential cases have been excluded based on test results and/or not meeting case criteria. “…a top CDC official is set to arrive on island next week to assess the handling of the outbreak here. Lyle Petersen, director of the CDC’s Division of Vector-Borne Diseases, will vet containment efforts and share his analysis with county and state officials during his visit, confirmed Gov. David Ige’s communications director Cindy McMillan. The Central Pacific Hurricane Center in Honolulu, Hawaii is issuing advisories on hurricane Guillermo located about 680 miles east-southeast of Hilo, Hawaii and moving west-northwest near 10 miles an hour. Guillermo advisories are being issued under AWIPS header TCPCP4 and WMO header WTPA34 PHFO. A weak low pressure area, the remnant of post-tropical cyclone Eight-E, was located about 515 miles south-southwest of Honolulu, Hawaii. This feature was moving west at 10 to 15 miles an hour. Atmospheric conditions are expected to remain unfavorable for redevelopment over the next couple of days. * Formation chance through 48 hours, low, near 0 percent. Isolated thunderstorms had been occurring in the vicinity of a weak low pressure area centered about 1245 miles west-southwest of Honolulu, Hawaii. This area was moving west around 10 miles an hour. Upper level winds will likely inhibit tropical cyclone development in this area over the next couple of days. Crewmembers on the space station photograph the Earth from their unique point of view located 200 miles above the surface as part of the Crew Earth Observations program. Astronauts have used hand-held cameras to photograph the Earth for more than 40 years, beginning with the Mercury missions in the early 1960s. The ISS maintains an altitude between 220 – 286 miles (354 – 460 km) above the Earth, and an orbital inclination of 51.6˚, providing an excellent stage for observing most populated areas of the world. The Department of Land and Natural Resources, Division of Conservation and Resources Enforcement (DOCARE) officers and DLNR Aquatic Resources staff are responding to a report of a shark incident that took place today between 8 to 8:30 a.m. in ocean waters between the County’s Punaluu Beach Park and Ninole, in Ka’u District of the island of Hawaii. It was reported by Hawaii County Police that a male, 29 years old and two friends were in the water body boarding about 7 a.m. About an hour later, while the male was paddling back out, he was about 20 yards from shore when he was hit and knocked of his board by a shark. Type of shark is thought to have been a 10 to 12 foot tiger shark according to the victim’s friends. According to DOCARE, water depth was about 8-12 feet , conditions windy with surf. The male was transported by friends via private vehicle to a hospital in Pahala with non life-threatening injuries. Hawaii County Police have confirmed to DOCARE that Punaluu Beach Park has been closed by Hawaii County Lifeguards. Lifeguards have posted shark warning signs at Punaluu beach park, which will remain closed the rest of today. The fire department helicopter flew over the area at 10 a.m. today and will do so again tomorrow morning, If there is no further sighting of sharks the park will reopen at noon tomorrow. Ka’u Kako’o, a local community outreach group at Punaluu will help to inform beachgoers that the beach is closed.